Hello my lovely card site! I have been a distracted mother. I’m so sorry my wonderful aetherweb child! But I am here, and card of the day seems a good dip back into the tarot pool. Madam Lydia Wilhelmina’s Tarot of Monsters, the Macabre and Autumn Scenes… I love that title! I really do. It simply invokes so many wonderful memories from a time in my past. That place where I would delight in autumn because I would watch Mary Poppins and Something Wicked This Way Comes. I’m not sure why these were my autumn movies as a kid, but they were. And honestly, not related to them, I would watch a variety of other movies I no longer remember the names for, though they inspired in me this vintage place where mysterious names (like a snake oil salesman slash people charmer) connected to equally mysterious (or even wickedly infamous) characters. I wanted that for myself. I wanted my own eerie mythos for autumn. With all that said, I have been stressing I’ve given the deck a nick name–the Lydia Tarot and for some, the Autumn Tarot. This card is from that deck. So, hello! Mr. King of Coins. Is Mr. appropriate? Meh, we’ll move on. Who is this card, this king? 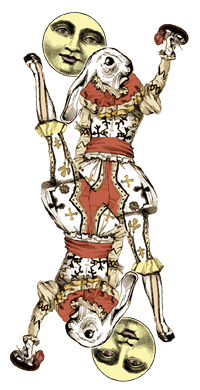 I want to be selfish and craft him around my zodiac sign. Let me say I find astrology fascinating for a few different reasons. In part because I am slightly nerd minded and how long standing mythical ideas and their influence on people do finding people shaping those things to their lives as an act of suggestion. After that? Simple belief. My great grandmother was a Rosicrucian. I found this out as an older person when my aunt passed along to me all the books of hers that her grandmother had given her. At that time what I knew of my great grandmother was that she was an incredibly kind and loving person. She’d lived life from a kid with rheumatoid arthritis and only used copper bracelets to treat the pain and joint issue. If you visited her she always sent you away with something beautiful or thoughtful she’d clipped from a magazine or book. She was that elder I wish I had met. She also created astrology charts for people, which was something she created as a Christian, which was one of the first times I realized: You can be raised in a loving environment of something not quite what you’re thinking and still have rooms for your own thoughts. What does that mean? 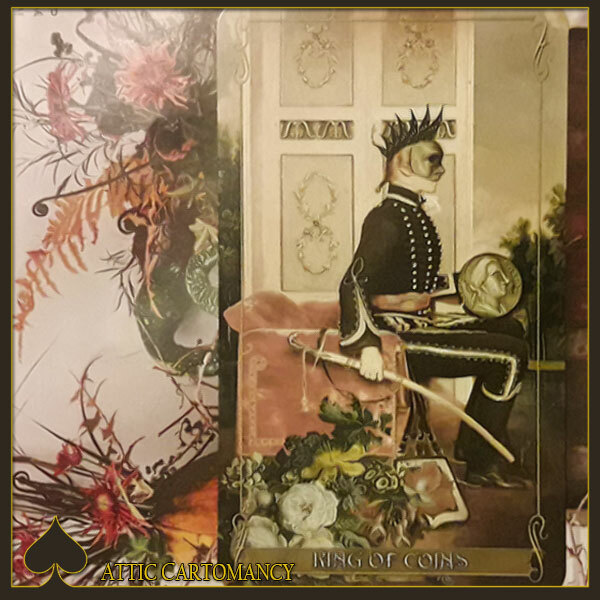 It means that as I look upon my King of Coins and think about how I relate to being a Taurus, I can relate to this card because it says a lot of the same things to me, without quite as much of the stubborn bullishness I also know. Yet these are things of comfort, materialism, and just what makes me feel safe. As it relates to my family (as mentioned) is being surrounded by people who are providers, they made sure my world was surrounded by what I needed and made me feel safe. We always wanted better, but we realized what we had and appreciated it. I didn’t always get what I needed from my mother when it came to envisioning a prosperous and stable life. I had to look around me at those who were living that life and extending to me when they could. So now I relate it to myself, as I tend to always do a one card draw as a thing of meditation or reflection. I look at this card and I am reminded that this is where I want to be in life. I want to be in a position to look after those around me and encourage them forward. I want to be a person who loves someone so much, and in loving them that way, is able to (sometimes) very harshly advise them on how they may be f*cking up and how to pull away from that. I think I might be obnoxious in saying this, but that for me this is the aunt towards niece card. Slowly I’ve turned into the aunt. Bittersweet.